In this morning’s mail I received our meat processing license from the Agency of Agriculture, Food & Markets division. We are now able to officially begin butchering under Vermont state inspection! It has been a long journey from conception through construction to cutting. In April of 2008 the butcher we were taking pigs to told us he wanted to retire and asked if we wanted to buy his place. We didn’t but I had long known that eventually we would build our own butcher shop. His announcement pushed up our plans to the forefront and we rapidly switched gears, putting other projects on the back burner. The following Monday I met with the head of meat inspection here in Vermont and then soon there after with the head of meat inspection for the USDA in New England. They gave me a 1 cubic-foot box of regulations and booklets to begin digesting. That was my reading material for the next nine months cumulating in HACCP training. In June of 2009 I secured all of the necessary permits to build. We began with the deconstruction of the old hay shed attached to our farm house. By late fall we had the foundation in place and the first wall forms built ready to pour concrete. I announced our Big Project in mid-November on my blog. During this process of learning, permitting, pre-construction and prepping I spent two years attempting to get grants and loans. None were available and banks weren’t lending so we funded the construction of the butcher shop from our own pockets using our savings, the cash flow from our farm & our sustainable logging, loans from friends & family, CSA Pre-Buys of whole pigs and about $30K from a Kickstarter project we did which was like the CSA Pre-Buys but for smaller packages of meat. Funding the butcher shop was truly a community project, made possible by many individuals who saw and understood the vision of small-scale on-farm butchery. Money was our limiting factor over the years that governed how fast we were able to progress with building the butcher shop in our spare time. Since we did all the construction work ourselves, materials were our biggest expense, headed up by insulation and concrete. This meant we had to be a bit extra ingenious in construction techniques – There are cold joints in the concrete, carefully designed and placed. We could only pour concrete as we had the money which meant we did it in stages, ever skyward. 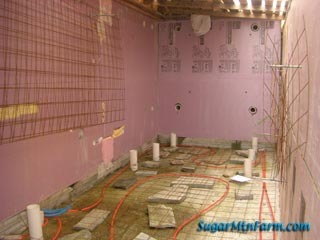 A pattern for us was to work on concrete forms and prep while we saved our pennies for months. Then about three times a year we would have a big day of concrete pouring and finishing to advance the next stage of construction. 2009: We got the old hay barn torn down, it’s parts becoming sheds across our farm, and build the foundation of the butcher shop. 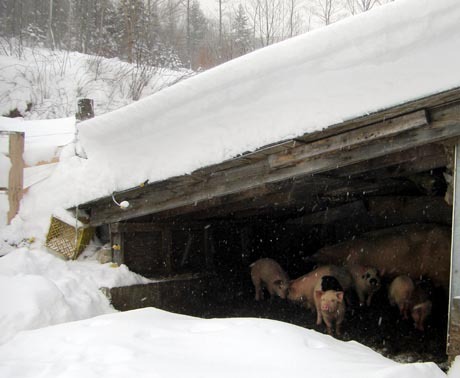 2010: We poured the lower walls all the way to the top just ahead of winter snows that stopped outside work each year. 2011 and 2012: The walls rose higher and we did the interior walls of the cold section of the building – isolated from the outer building as we built nested shells for energy conservation. 2013: We poured the three inner shells for the brine room, cooler and freezer which has R120 insulation at the deepest room. 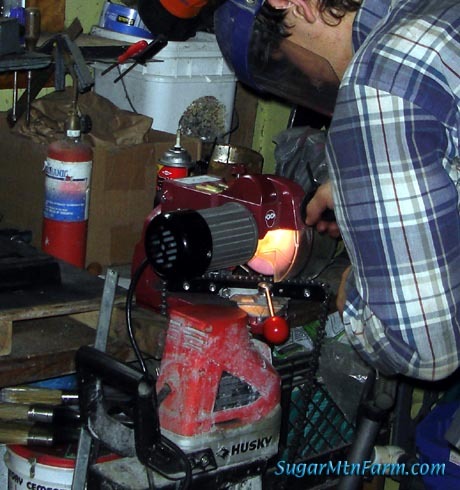 Will taught himself metallurgy, metal working and how to weld stainless steel so he could make equipment, counters, tables, shelves and doors for our facility. Meanwhile Ben taught himself rock working so that he was able to do the granite sills and the marble throughout our facility as well as doing most of the grinding of our walls. While they did that I learned about coatings so that we could seal our concrete, ultimately choosing Polyurethane and Polyurea which we put in in eight coats. 2014: We poured the building’s concrete roof in two stages and began to finish off the interior of the Phase I section: Admin which contains the inspector’s office, bathroom, hall and initial cutting room (iCutter). 2015: We completed Phase I construction. The inspectors inspected and loved our construction. I had involved them from the very beginning – a crucial decision as they have many insights that we benefited from. This summer I wrote our HACCP plan, submitting it for review the first of September. While we waited for approval and licensing we cut three half pigs under the Custom Exempt rules[1,2,3] with the final cutting under the tutelage of master butcher Cole Ward with whom we apprenticed for 18 months to learn the art of butchering a pig. 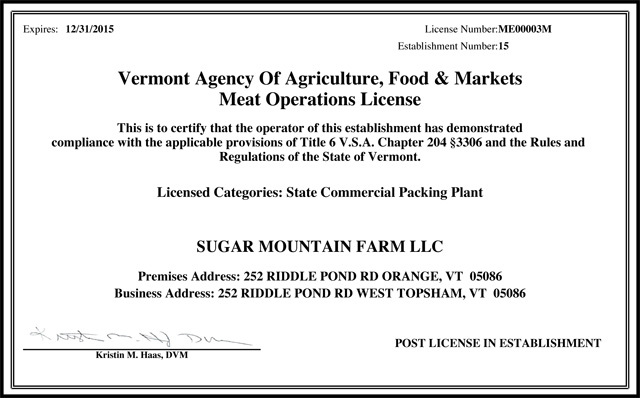 Today all those years of hard work and attention to detail paid off with the licensing of our own on-farm butcher shop at Sugar Mountain Farm. 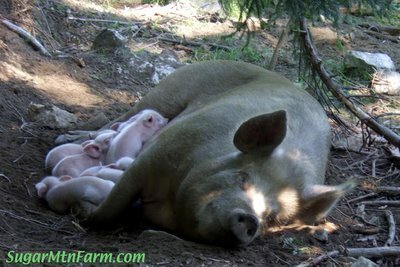 Now we will be able to do the meat cutting and sausage making of our pigs for our customers including stores, restaurants and individuals within the state of Vermont. 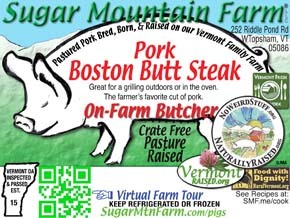 This means we can begin delivering meat to individuals within Vermont (pickup along our delivery route or here at the farm) as well as deliveries to our wholesale customers, stores and restaurants within Vermont’s borders. Yesterday we delivered the pig to the slaughterer which will be our first pig that we will cut under inspection. The first week we’ll do just one of the pigs that went to slaughter – the rest of that week’s batch will be butchered at the Adams† family facility. 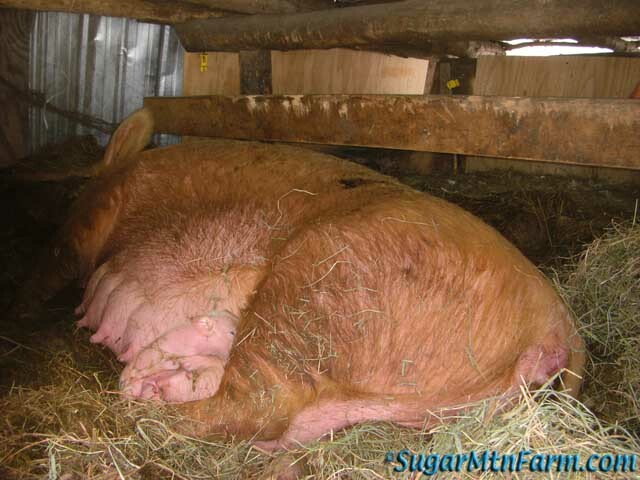 We are doing a soft startup – previously we did three weeks of half pigs under Custom Exempt regulations. 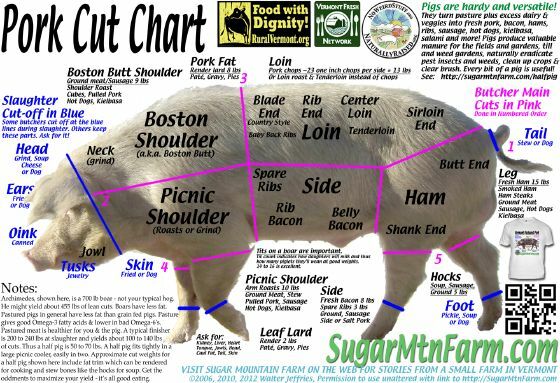 In subsequent weeks we will ease into full scale production: butchering two, four and then all of our weekly market pigs as we perfect the patterns of processing. It is a dance where we’re mastering the steps. I’ve read many reports on building meat processing facilities. The general consensus is that it typically takes ten years from conception to opening. We made it in seven years doing it all ourselves. That is a pretty remarkable achievement. For the next 90 days we’ll be doing validation, the process that proves our systems work. 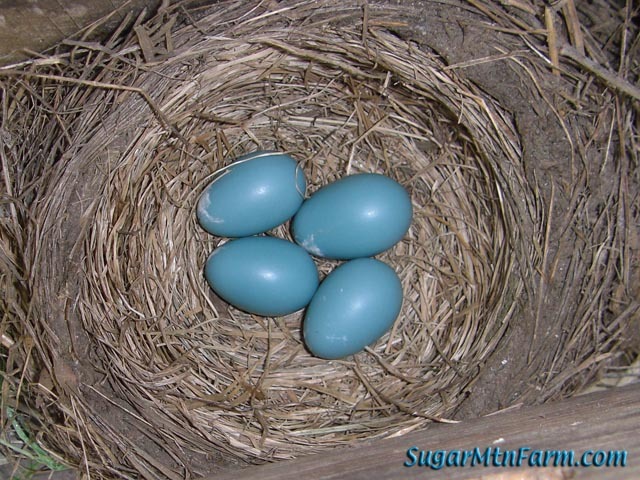 At the end of the period we’ll then be able to apply for USDA inspection – some time in the winter. At that point we’ll then be able to deliver to customers outside of Vermont. This winter we’ll work on the walk-in freezer, cooler, brine and cave rooms as part of Phase II of our Big Project. Later we’ll finish off the final cutting room which will be about three times the size of iCutter – allowing space for an emulsifier for making our hot dogs. The iCutter will become our warm kitchen and smokehouse eventually. Slaughter will come later with the finishing off of the lairage, abattoir, carcass chiller and aging room. Ironically, slaughter costs us the least to have done but is the most expensive portion of the building to finish off and equip so it makes sense for that to happen last. Meat cutting, the butchering, costs the most and is the least costly to build out after completing the shell of the building. By breaking the project down into phases we make it doable – the savings achieved by each phase pays for the construction of the next phase. From conception to cutting our kids grew up constructing the butcher shop. Previous to that they had worked with us with building our tiny cottage where we live just up the mountain. Doing these projects involved learning math, geometry, chemistry, construction, dedication to long term projects, time management and a host of other skills. It has been a homeschool project without precedence, a project where they helped to create what many people view as impossible in this day and age: a family designed, build, owned and operated on-farm meat processing facility to USDA regulatory code. While we only do processing for our own farm I do hope that the tale and details of our journey will help others to build nano-scale butcher shops to serve their own farms and local communities. 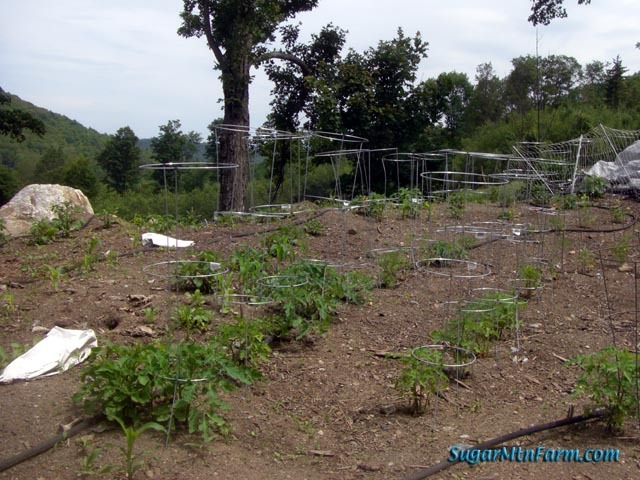 Already several farms have used what we learned to do similar projects. Perhaps in the coming years we’ll see a renaissance of small scale butchering on-farms throughout the lands. Daily Spark: ”It ain’t over till it’s over.” In July 1973, Berra’s Mets trailed the Chicago Cubs by 9½ games in the National League East. The Mets rallied to clinch the division title in their second to last game of the regular season. †If you need your animals butchered I highly recommend Adams Farm in Athol, Mass. They do a great job! We have worked with them since 2009 and are very pleased with their professionalism, dedication, animal handling and quality of work. Whoopee! I’m delighted to be the first to congratulate you on this long-awaited milestone. Happy cutting! Congratulations! So exciting, can’t wait to see what happens in terms of charcuterie in the future. I am honoured to be among those who congratulate you all on achieving this amazing milestone. May your work continue to prosper! One thing I’m curious about though. The only difference between your premises and business addresses is the name of the town. Even the postal code is the same. Is that one of those odd tax things? There is no post office in Orange. There is a post office in West Topsham which serves about ten surrounding towns including Orange. We’re about a mile and a half up the street from it. Both addresses get here because the zip code rules. I have been following this construction for some time now. I am pleased to see it come to pass. I hope to eat some of your product soon! 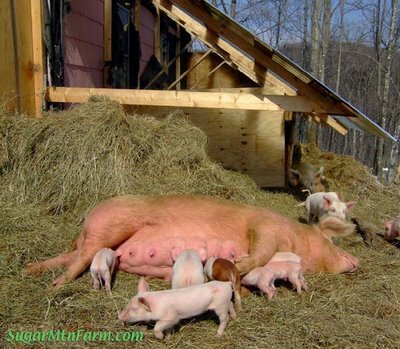 Congratulations to all the Jeffries at Sugar Mountain Farm! What an accomplishment, very impressive indeed. Thank you for sharing your journey, it’s been enjoyable following your progress along the way. I hope you all can take the time to celebrate this incredible milestone as you’ve certainly earned it! Now that you’ll have all this free time , maybe you can finally write “the book”? !